*It was wonderful starting off the morning at work talking to a guy who recently moved to Wallace from Coeur d’Alene. He and his wife still work in Coeur d’Alene, but they decided to buy a house and live in Wallace. They had a day off, so they decided to walk around town this morning, and check out some shops, and wandered into the mine tour office and gift shop. He commented about how much he loved living in Wallace, and how friendly everyone is, and how glad he is to make it his home. I love hearing stories like this from people who move to the Silver Valley. Because I love living here, too, and I am glad new comers feel welcome, and appreciate the slower pace of life. *When I arrived home from work, Paul was getting ready to grill some Rockfish, and he asked me about making a slaw with the Brussels Sprouts in the fridge. I told him I wasn’t sure how good those sprouts were, but I could go pick one of our beautiful cabbages from our garden and make a slaw out of that. So that is what I did. 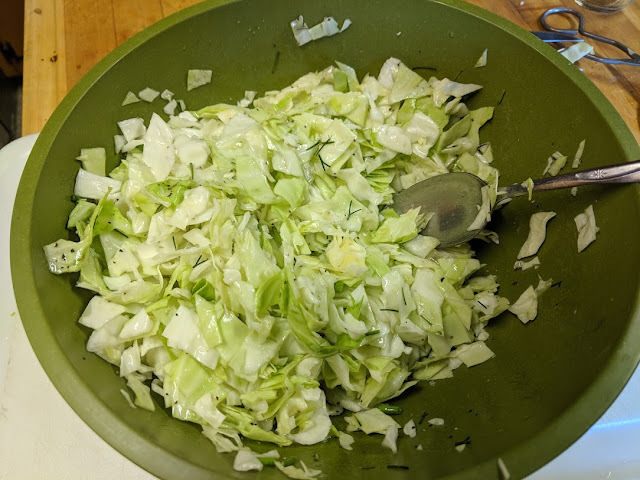 I cut up half of a fresh picked cabbage, added some avocado oil, white wine vinegar, salt and pepper. Then I went back to the garden and picked some dill weed and some rat tail radishes, and cut them up and added them to the slaw. As the Chopped judges would say, the dill and radishes added a “brightness and texture to the dish”. It was really delicious!! And it paired perfectly with the Rockfish. *Things had been piling up on the desk in my bedroom, so tonight I took some time to go through the piles, and get a little organized. Much of the piles consisted of things “needing to be filed”. I did add some hanging files to the lower desk drawer. Now I need to get some file folders and start adding things to them. I also realized a need a desk lamp.